Tau protein is a neuronal microtubule-associated protein (MAP), which localizes primarily in the axon. It is one of the major and most widely distributed MAPs in the central nervous system. Its biochemistry and molecular pathology is being increasingly studied. 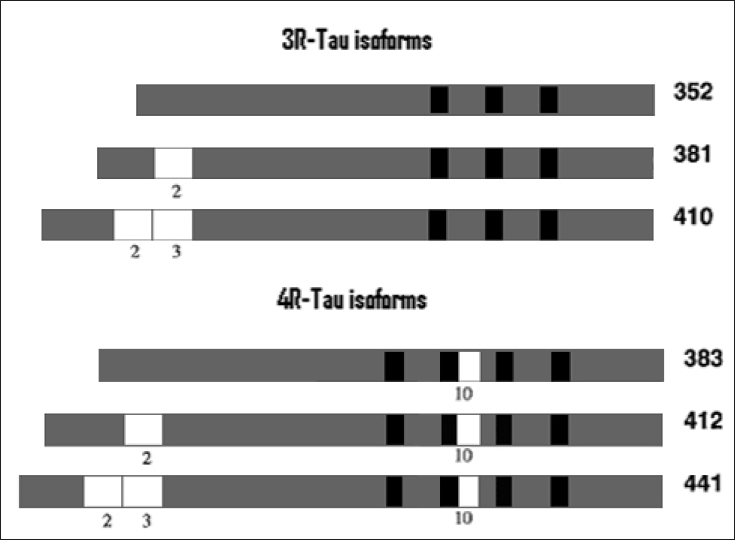 Tau is a key component of neurofbrillary tangles in Alzheimer's disease (AD). Disorders with neuronal, oligodendroglial or astrocytic filamentous tau inclusions are now grouped under the common rubric of tauopathies. The discovery of mutations in the tau gene, located on Chromosome 17 and its relationship to frontotemporal dementia with Parkinsonism (FTDP-17) has enhanced the importance of tau protein in cognitive neurology. Aberrant aggregates of tau have been documented in most of the neurodegenerative diseases with filamentous inclusions. The role of cerebrospinal fluid tau in the diagnosis of dementias is being investigated quite extensively. Recently, it has been shown that Abeta immunotherapy leads to the clearance of early tau pathology. It is becoming clearer that understanding tau better will lead to better understanding of many neurodegenerative diseases that may help develop interventional strategies. Background: Conventional methods in the diagnosis of carpal tunnel syndrome (CTS) in patients with polyneuropathy (PNP) are insufficient. 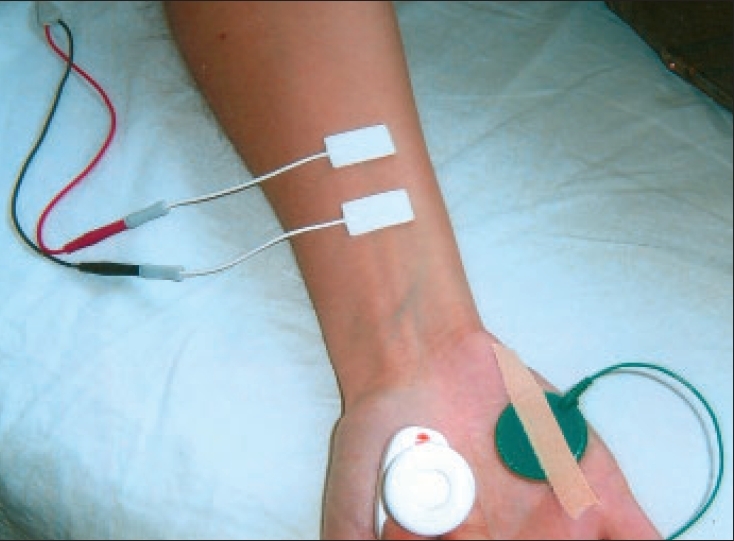 Aims: We suggest that the comparison of the conduction of the median nerve with that of the neighboring peripheral nerves may be more beneficial in the diagnosis of entrapment neuropathy. Setting and Design: The median nerve sensory conduction in healthy volunteers, in cases of CTS, PNP cases without CTS and in cases of PNP in whom clinical findings point to CTS, were compared by palmar cutaneous nerve (PCN) sensory conduction. Materials and Methods: Comparative parameters were difference of PCN-1st digits' nerve conduction velocities (NCV), PCN/1st digit NCVs ratio, difference of 5th-2nd digits' NCVs and 5th/2nd digits' NCVs ratio. Statistical Analysis: The statistical analysis was performed by the SPSS package for statistics. Student t test and receiver operating characteristic were used. Results: Although the ratio of PCN-1st digit did not differ significantly between the control group and the polyneuropathy group, there was a significant difference between CTS and PNP+CTS groups and the control group ( P <0.001 and P <0.001, respectively). The ratio of PCN-1st digit nerve conduction velocity was also significantly different between polyneuropathy and PNP+CTS groups ( P <0.001). Conclusion: To diagnose CTS on a background of polyneuropathy in mild cases in which sensory conduction is preserved, the ratio of sensory nerve conduction velocities of the palmar cutaneous nerve and the median nerve 1st digit-wrist segment may be a criterion. Background: Peripheral nerve trunk involvement in leprosy is very common. However, by the time it becomes clinically manifest, the damage is quite advanced. If the preclinical nerve damage can be detected early, the deformities and disabilities can be prevented to a large extent. Aims: To assess the electrophysiological functions of the ulnar and median nerve trunks in cases of clinically manifest leprosy with and without manifest nerve damage at different durations of nerve damage. Materials and Methods: Electrophysiological functions of ulnar and median nerves were studied in leprosy patients, both normal and at different stages of disease and damage. PB cases, having disease for six months or less, without neurological symptoms and clinically normal appearing nerve. Statistical Methods: Mean was taken of different values. The changes in values of different parameters were expressed as percentage change with reference to the control values (increase or decrease). Results: Reduced nerve conduction velocities and changes in latency and amplitude were observed. Changes in sensory nerve conduction were more pronounced. Sensory latencies and amplitude changes were more severe than motor latencies and amplitudes in cases with manifest muscle palsies. Changes in MB cases were less marked. Conclusions: Further studies are needed to identify parameters likely to be helpful in the diagnosis of early nerve damage. Background: India is a populous country housing over a billion people. 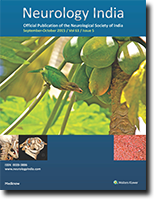 Neurology as a specialty is being practiced in India for over 50 years but the number of physicians devoted to fulltime neurology is limited. This fact coupled with the privatized healthcare system and limited infrastructure has led to situations different from the more developed healthcare systems. Aim: To study the practice patterns of neurology in India. Setting and Design: Questionnaire-based study. Materials and Methods: Questionnaire was sent to 250 members of the Indian Academy of Neurology [sample size approximately 25%] using random number table. The responses were tabulated and analyzed. Results and Conclusions: The neurology group is small and hence is exposed to a large workload. 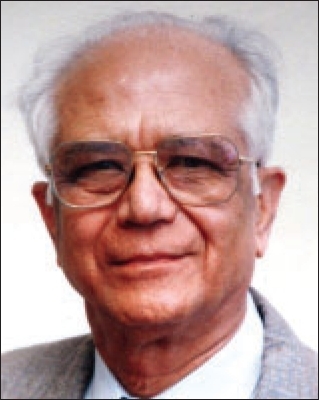 The average number of patients seen daily by Indian neurologists is three to four times those seen by the United States and United Kingdom neurologists. Neurologists based at district places are more likely to see direct patients; whereas metropolitan neurologists see more referrals. Investigative facilities are available to neurologists but affordability is a concern. Clinical work leaves less time for academic and research activities, which the consultants are keen to participate in. In the privatized health system of India, emergency work constitutes a difficult area to cope with. The concept of single specialty group practice is welcomed by the majority with the idea of streamlining their work and life. These factors highlight an urgent need for increasing the neurology work force and argue for further involvement of primary physicians and internists in neurological care in India. Context: The microsurgical anatomy of the posterior circulation is very complex and variable. Surgical approaches to this area are considered risky due to the presence of the various important blood vessels and neural structures. Aims: To document the microsurgical anatomy of the posterior circulation along with variations in the Indian population. Materials and Methods: The authors studied 25 cadaveric brain specimens. Microsurgical dissection was carried out from the vertebral arteries to the basilar artery and its branches, the basilar artery bifurcation, posterior cerebral artery and its various branches. Measurements of the outer diameters of the vertebral artery, basilar artery and posterior cerebral artery and their lengths were taken. Results: The mean diameter of the vertebral artery was 3.4 mm on the left and 2.9 mm on the right. The diameter of the basilar artery varied from 3-7 mm (mean of 4.3 mm). The length varied from 24-35 mm (mean of 24.9 mm). 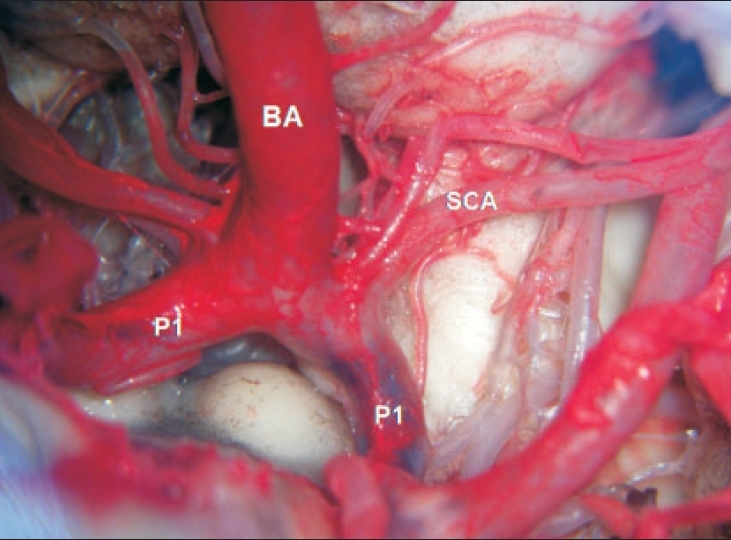 The basilar artery gave off paramedian and circumferential perforating arteries. The origin of the anterior inferior cerebellar artery (AICA) varied from 0-21 mm (mean 10.0 mm) from the vertebrobasilar junction. 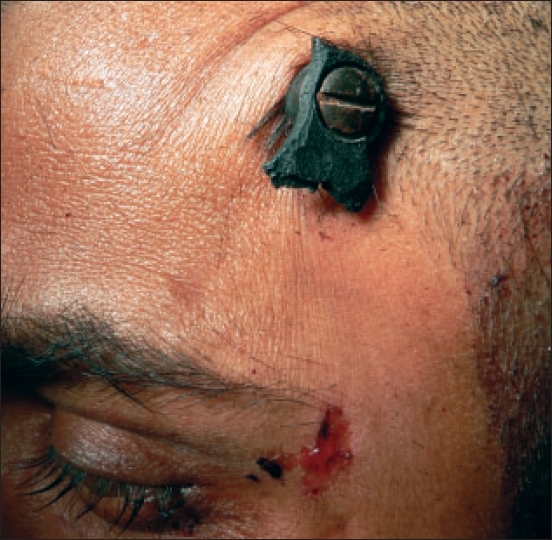 The diameter of the AICA varied from being hypoplastic i.e., < 0.5 mm to 2 mm (mean 1.0 mm). The superior cerebellar artery (SCA) arises very close to the basilar bifurcation, in our series (1-3 mm from the basilar artery bifurcation). The diameter of the SCA varied from 0.5-2.5 mm on both sides. The posterior cerebral artery (PCA) is divided into four segments. The PCA gave rise to perforators (thalamoperforators, thalamogeniculate arteries, circumflex arteries and peduncular arteries), medial posterior choroidal artery, lateral posterior choroidal artery and cortical branches. In 39 specimens the P1 segment was found to be larger than the posterior communicating artery, in six specimens it was found to be equal to the diameter of the posterior communicating artery and in five specimens it was found to be smaller than the posterior communicating artery diameter (fetal circulation). Conclusions: The authors have documented the various anomalies as well as the differences of the anatomy in this area in the Indian population as compared to the Western literature. 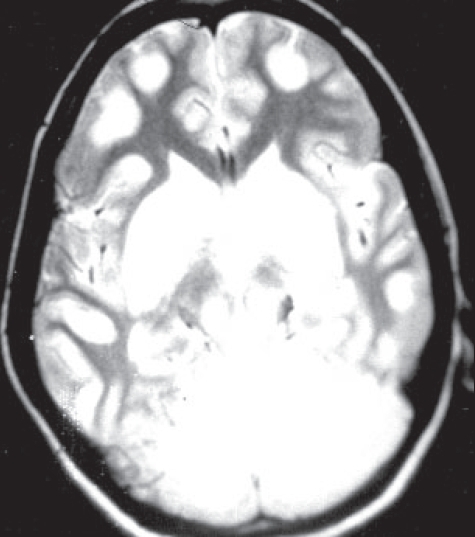 Background: Patients with solitary cysticercus granuloma (SCG) develop acute symptomatic seizures because of the inflammatory response of the brain and the seizures are self-limiting. Thus seizure disorder associated with SCG provides a good model to study the total cost of illness (COI). Materials and Methods: COI of new-onset seizures associated with SCG was studied in 59 consecutive patients registered at the epilepsy clinic. Direct treatment-related costs and indirect costs, man-days lost and wages lost were evaluated. The relative cost was calculated as the percentage of per capita gross national product (GNP) at current prices for the year 1997-1998. 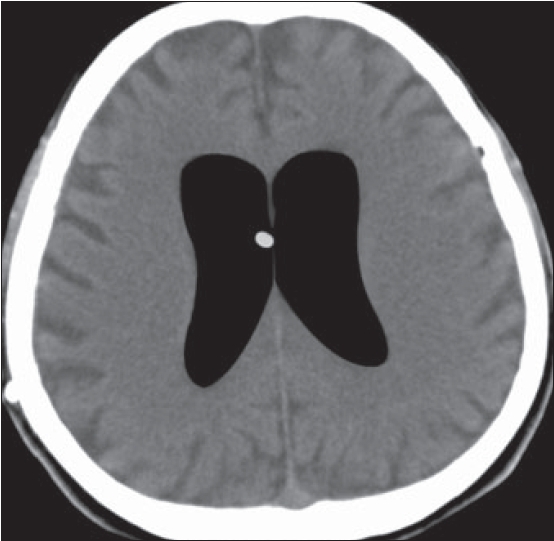 Results: The total COI, for treating seizure disorder associated with SCG per the period of CT resolution of the lesion per patient was INR 7273.7 (US$ 174.66, I$ 943.16) and he/she would be spending 50.9% of per capita GNP The direct cost per patient was INR 5916 (US$ 137.14, 41.4% of per capita GNP). If the patient had received only AEDs for the period of resolution of CT lesion, the cost would be INR 5702.48 (US$132.2, 40% of per capita GNP). The extra expenditure on albendazole and steroid was INR 213.72 (US$ 4.95), 3.6% of the total direct cost and 20.7% of the medication cost. Indirect cost (average wage loss) per patient was INR 1312.7 (US$ 30.42) and it accounted for 9% of per capita GNP. The one-time expenditure at present costs (adjusted for inflation) to the nation to treat all the prevalence cases is to the tune of INR 1.184 billion (US$ 2.605) and 0.0037% of GNP. Conclusions: This study suggests that seizure disorder associated with SCG, a potentially preventable disorder, is a good model to study the total COI. The one-time expenditure at present costs to the nation to treat all the prevalence cases of seizure disorder associated with SCG is to the tune of INR 1.184 billion (US$ 2.605 million) and 0.0037% of GNP. Background: Given the constraints of resources, thrombolysis for acute ischemic stroke (AIS) is under evaluation in developing countries. Prothrombin time (PT), platelet count and activated partial thromboplastin time (aPTT) may not be feasible within the time window. Aim: To evaluate the safety and efficacy of thrombolysis in selected patients without the coagulation profile. Design: Open, nonrandomized, observational study. Materials and Methods: Fifty-four stroke patients were classified using TOAST criteria (large artery atherosclerotic = 13; cardioembolic = 12; small vessel occlusion = 22; other determined etiology =three; undetermined etiology = four). The mean time to reach emergency was 2.4h (1.15-3.4), the mean door to CT, 24 min (10-47) and the door to recombinant tissue plasminogen activator (r-tPA) injection, 26.8 min (25-67). The NIHSS scores ranged from 11 to 22 (mean = 15.5 ± 2.7). 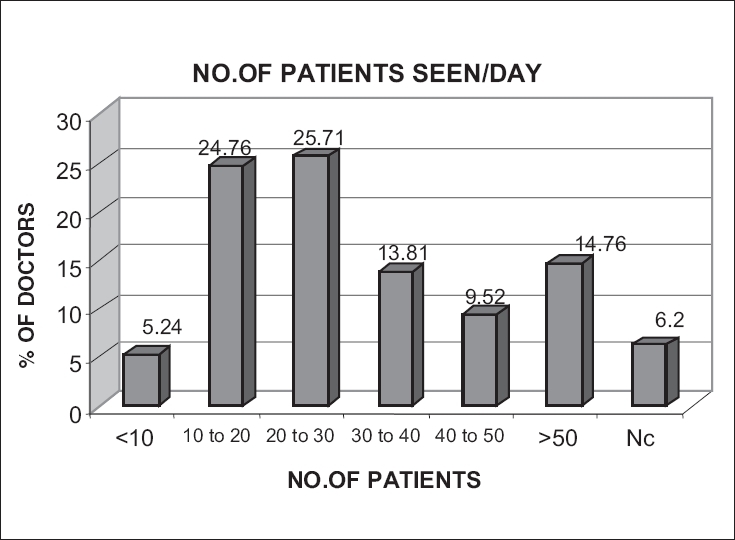 Patients with history of liver or renal disease or those on anticoagulants were excluded. The PT, aPTT and platelet count were not done. Recombinant tissue plasminogen activator was administered at a dosage of 0.9 mg/Kg. Results: Thirty-five patients (65%) significantly improved on NIHSS at 48h (³4 points) (mean change = 10; range= 4-17). At one month, 43 (79%) improved on Barthel Index (mean change = 45%). One each developed small frontal lobe hemorrhage and recurrent stroke; one died of aspiration; and eight showed no improvement. Conclusions: Hyperacute thrombolysis was found useful and safe in selected patients with AIS even without the coagulation studies. Background: Multi-minicore disease is a rare form of myopathy characterized by slowly progressive or nonprogressive muscle weakness and characteristic multiple cores within the muscle fibers. To the best of our knowledge, this is first documentation of the clinicopathological features of this rare entity from India. Materials and Methods: A ll cases of multi-minicore disease diagnosed in our laboratory were retrieved. Clinical and pathological features were reviewed. Result: During a period of two years (January 2004 to December 2005), we received 985 muscle biopsies for various reasons. Of which, 15 were diagnosed as myopathies and four of which were of multi-minicore disease. Thus, multi-minicore disease comprises 0.40% of all muscle diseases and 26.6% of all myopathies. All were male and presented in early childhood (first decade of life) with generalized hypotonia and muscle weakness. All of them had dysmorphic facies and three had high arched palate. CPK levels were normal and EMG was myopathic except in one patient. Microscopic examination revealed minimal changes with Type I fibers' predominance but characteristic multiple cores in the myofibers. Ultrastructural examination showed both structured and unstructured cores. Conclusions: Multi-minicore disease, although a rare form of myopathies, should be suspected in children who present with generalized hypotonia and slowly progressive muscle weakness along with dysmorphic facies. 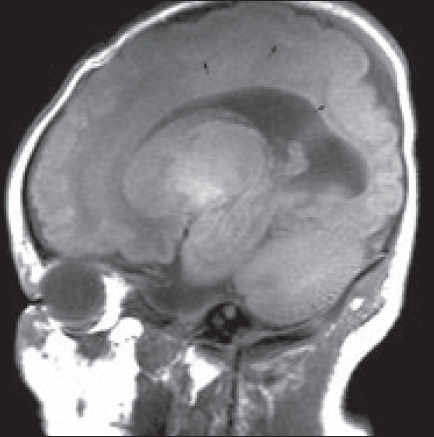 Pediatric intramedullary schwannoma without neurofibromatosis is extremely rare with only five cases reported so far. We present this rare finding in an 8-year-old boy who presented with a sudden onset of weakness in all limbs. 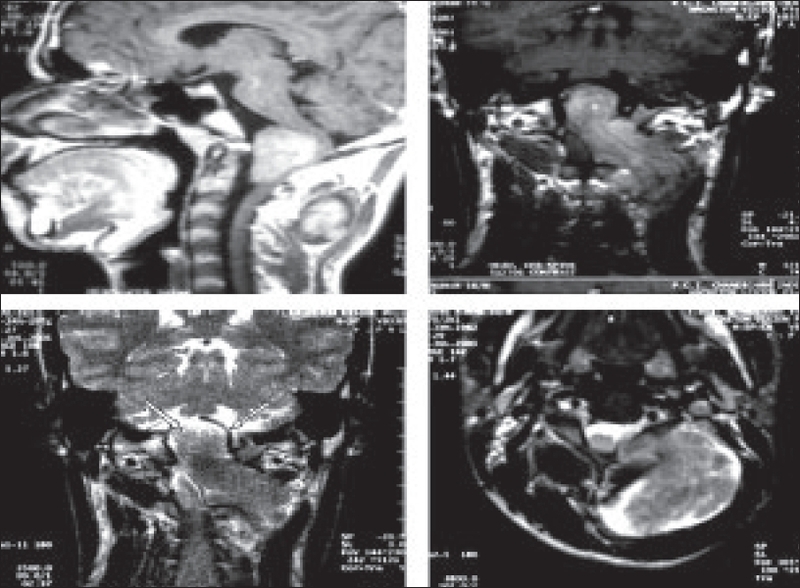 An intraoperative diagnosis of schwannoma enabled us to carry out a total excision of the tumor, which resulted in near complete recovery at 18 months follow-up. Although rare, this diagnosis should be considered when a child presents with a solitary intramedullary tumor, since its total resection can be achieved improving surgical outcome. Pachygyria is a disorder of neuronal migration. We report an Indian family with four siblings with developmental delay, infrequent seizures, normal head size and mild to moderate mental retardation. Two of them had bilaterally symmetrical frontotemporal pachygyria. Dysmorphism and neurological signs were absent in the affected subjects. 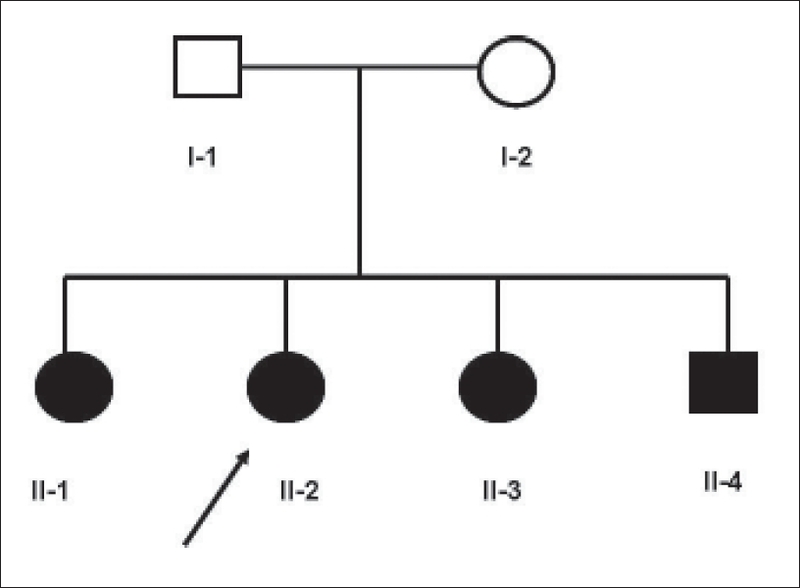 Affected male and female siblings with normal parents suggests autosomal recessive mode of inheritance. 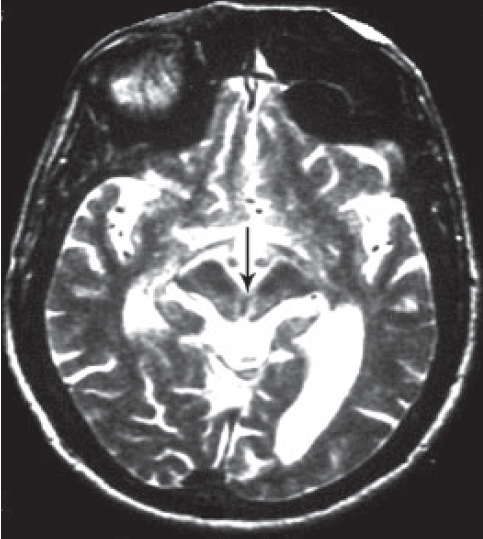 We believe these cases represent a new autosomal recessive disorder of neuronal migration. Other similar cases of lissencephaly are reviewed. 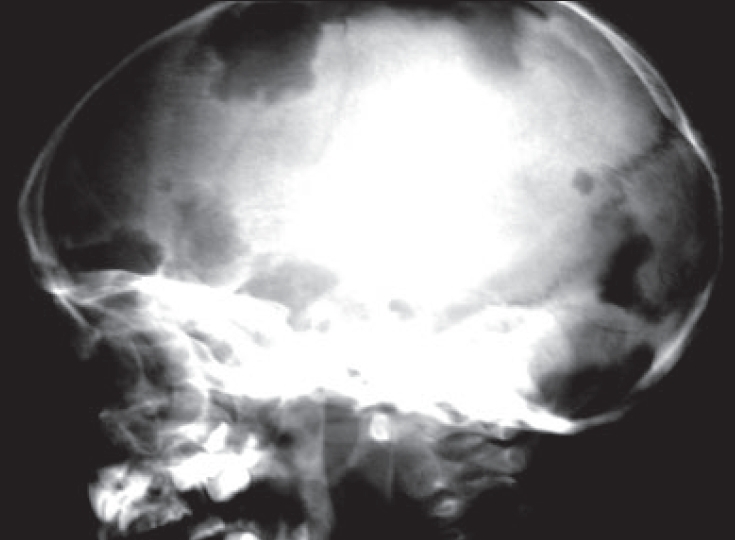 Two patients with giant dumbbell foramen magnum neurinomas are reported. 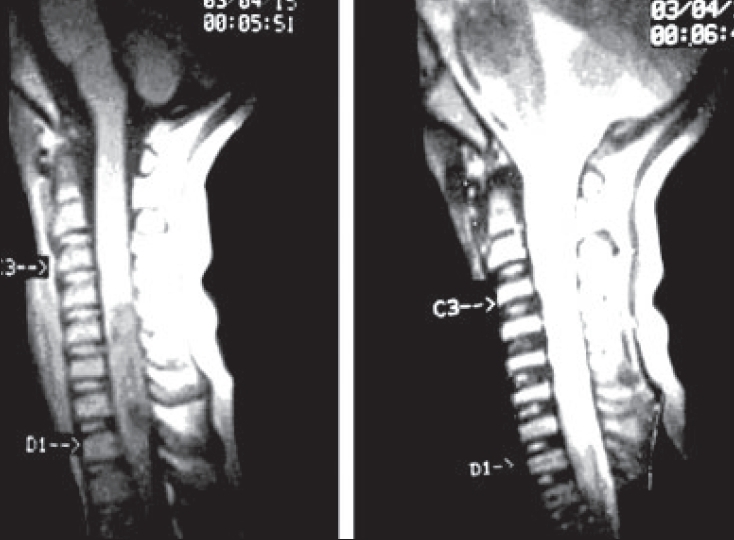 The intradural component was located anterior to the cervicomedullary junction while the extradural and extraspinal portion of the tumor had grown large enough to present as a neck swelling. In both patients total surgical removal was achieved by a single-stage posterior midline approach. Both patients had complete neurological recovery. The authors describe an extremely rare case with malignant peripheral nerve sheath tumor (MPNST) with focal epithelioid differentiation presenting as an intraosseous lesion of the spine. 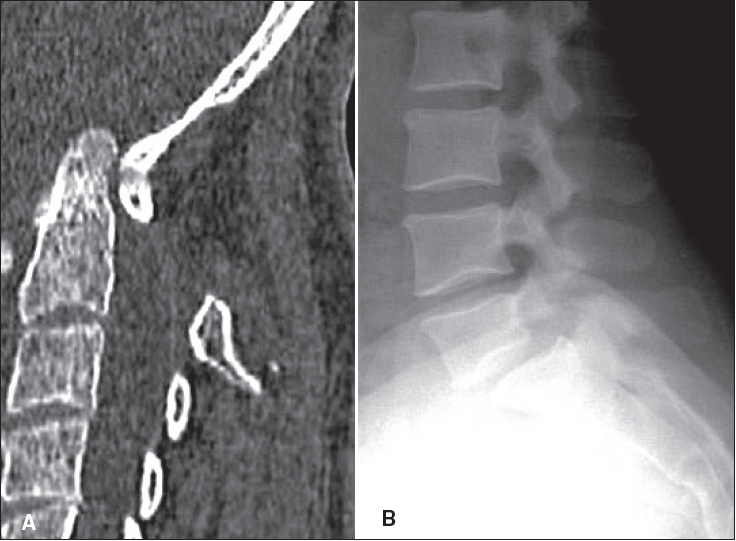 A 75-year-old woman presented with progressive paraplegia caused by epidural mass arising from the posterior element of the T7 vertebra. At surgery, the lesion was noted to originate from the T7 vertebra and separate from the dura and spinal nerve roots. 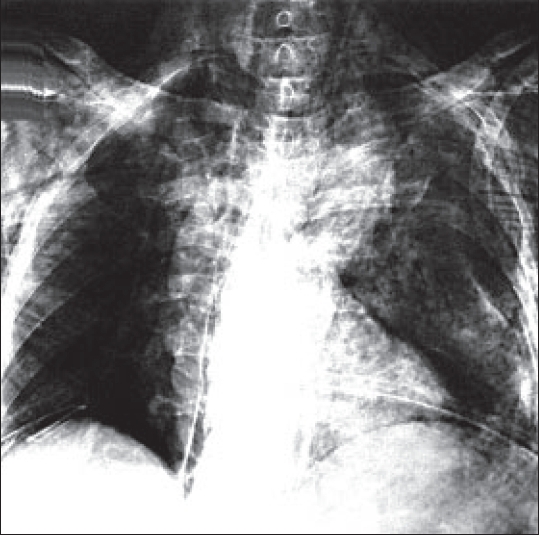 The patient died of tumor metastases to the lungs six months after the initial presentation. Histological diagnosis was MPNST. However, the tumor also contained cystic structures lined by epithelioid cells, requiring differentiation from synovial sarcoma. From the histological and immunohistochemical features, as well as the absence of SYT-SSX fusion gene expression, the diagnosis of MPNST with focal epithelioid differentiation was made. 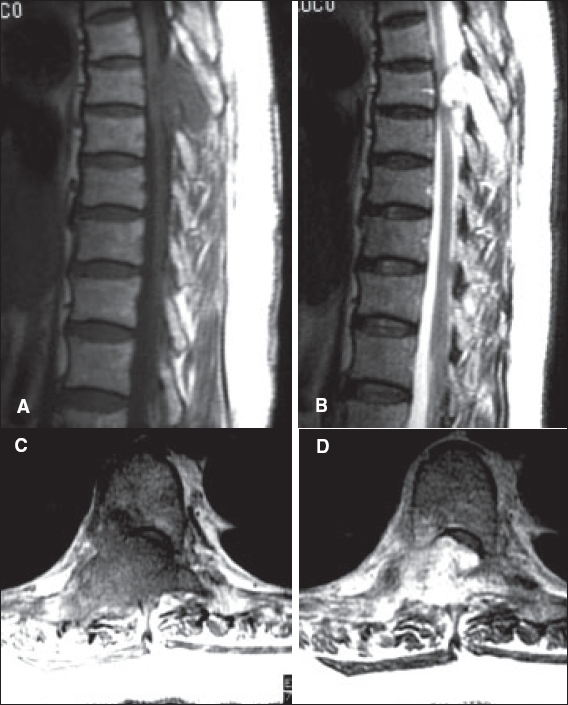 This is the first case report of intraosseous MPNST of the spine with a peculiar biphasic appearance. The French physician Augustine Marie Morvan first used the term 'la chorιe fibrillare' to describe a syndrome characterized by peripheral nerve hyperexcitability, dysautonomia, insomnia and fluctuating delirium. There are no published reports of the condition from the Indian subcontinent. We report the first such case from the region. Our patient, a 24-year-old male, presented with easy fatigability and stiffness in both the calves for 18 months; continuous twitching of muscles of all four limbs and jaw for two months; hyperhydrosis, palpitations, urinary symptoms, burning dysesthesia in hands, insomnia and abnormal sleep behavior for about a month. Patient had bilateral hyper-reflexia with extensor plantar on the right and equivocal response on the left. 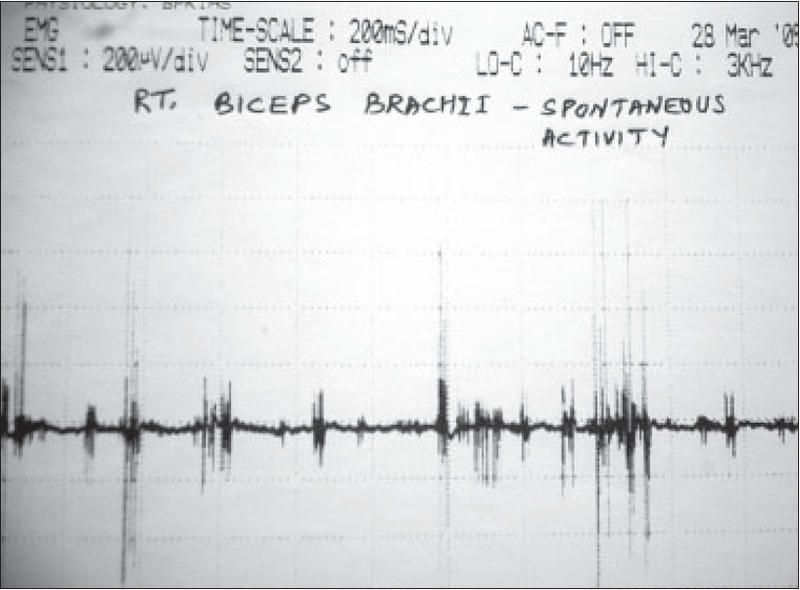 Electromyography revealed continuous muscle fiber activity. Thyroid function test, electroencephalography, computerized tomography scan (head) and routine cerebrospinal fluid analysis were normal. The patient showed marked clinical and electrophysiological improvement on prednisolone along with symptomatic therapy over the next two months. Nemaline rod myopathy (NM) is a rare form of congenital myopathy characterized by slowly progressive or nonprogressive muscle weakness and pathognomonic rod-like structures within the muscle fibers. To the best of our knowledge, this is first documentation of the clinicopathological features of this rare entity from India. All cases of NM diagnosed in our laboratory were retrieved. Clinical and pathological features were reviewed. During a period of 1.5 years (Jan 2004 to June 2005), we received 750 muscle biopsies for various reasons. Of which, 15 were diagnosed as congenital myopathies and four as nemaline rod myopathies. Thus, NM comprises 0.53% of all muscle diseases and 22.6% of all congenital myopathies. All of them presented in childhood (first five years of life) with generalized hypotonia, feeding problems, repeated respiratory infections and muscle weakness. Both males and females were equally affected. The CPK levels were normal and EMG was myopathic. Microscopic examination revealed minimal changes but characteristic red-colored material was seen on modified Gomori trichrome staining which was immunopositive to alpha actinin. Ultrastructural examination confirmed this material to be nemaline rods. NM, although a rare form of congenital myopathies, should be suspected in children who present with generalized hypotonia, repeated chest infections and slowly progressive muscle weakness. This report highlights the importance of histochemistry and ultrastructural examination in the diagnosis of this entity, in the absence of the availability of methodology for genetic studies. 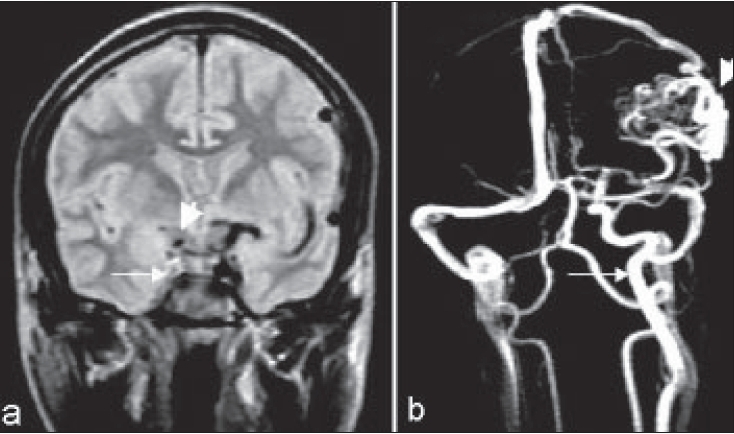 We report an interesting case demonstrating co-occurrence of radiological features of progressive supranuclear palsy (PSP) and corticobasal degeneration (CBD). 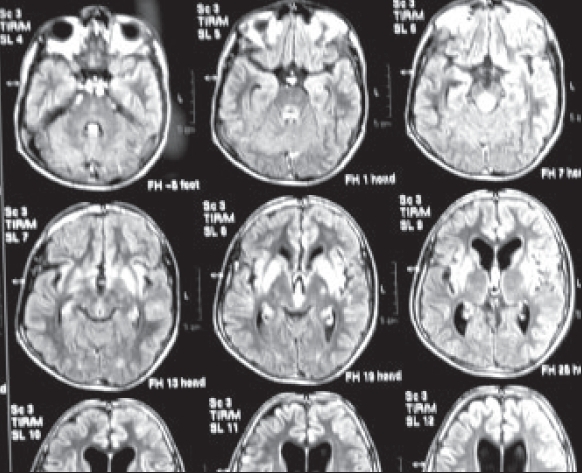 The clinical features were typical of PSP but magnetic resonance imaging (MRI) showed both typical brainstem changes of PSP and an atypical pattern of cortical atrophy. While the MRI had markers of CBD, the clinical features were not classical of CBD. 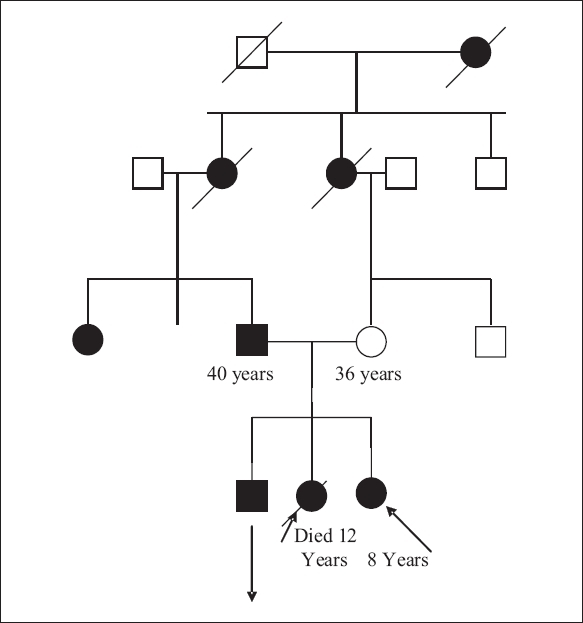 Three siblings (two girls and one boy) and their father are reported who developed Huntington's disease (HD). The two girls had onset at less than six years of age, while the boy started with symptoms at 12 years of age. The girl, the child number two, has expired and the youngest one is in a vegetative state. The elder brother is still mildly affected. The disease presented in a severe form and early in the females while it remained mild and presented late in the males. This is a rare disease involving all the three surviving siblings and their father. The diagnosis was confirmed after genetic testing.